I was away from the TV last night (reviewing the film “Contagion”), so I couldn’t get to the new episode of Doctor Who until this morning. We may be on a similar schedule next week, but I’ll make an effort to get these reviews out the night of for the last two episodes, or at the very least, the finale. Tom MacRae’s “The Girl Who Waited,” on the other hand, is a standalone that absolutely earns its right to exist. It’s more or less everything we want out of a good Doctor Who story: an imaginative setting on a foreign world, cool, creative new enemies, and an ingenious use of time travel. This is exactly the kind of hour Moffat himself would have penned back in the Russell T Davies era, and while I still think this season has had some major structural issues thus far, “Waited,” like “The Doctor’s Wife,” is such a strong episode that for one week, at least, that hardly matters. After spending last week’s episode isolated in the cupboard, Amy and Rory are at the forefront this week, and like the best sci-fi stories, MacRae used a fantastical setting and situation to analyze their relationship. When it comes to the Ponds, we’ve seen plenty examples over the last two seasons of how much Rory loves his wife; most notably, he spent 2000 years as a Centurion protecting her. Though it’s been made clear that Amy loves Rory very much, she’s never made the same sort of grand gesture, and that’s basically the whole premise of “The Girl Who Waited.” When forced into the worst circumstances imaginable, will Amy’s love for Rory remain, and what will she do to keep that love alive? It’s a very strong dramatic core for the story, and MacRae deploys it expertly, tugging at our heartstrings for the better part of 45 minutes. Though much of the interaction between the old and young Amy’s highlighted their differences – especially how sixty-year-old Amy had become bitter, resentful, and paranoid – the important thing was what they had in common, that old Amy’s love for Rory hadn’t abated during the last thirty-six years. Old Amy’s final decision ultimately hinged not on her own self-preservation or interests, but on giving Rory a chance to grow old with the woman he fought so hard for, and that gave the final act a tremendous sense of emotional weight. I can’t possibly give Karen Gillan and Arthur Darvill enough praise for their work on this episode, as both gave their best performances to date. Gillan especially was asked to do more than ever before, playing two distinct versions of Amy, one of which was shockingly different from the Amy we know and love. With the help of some extremely impressive prosthetics, Gillan did just that, creating an older, angrier version Amy that was nevertheless recognizable as the same girl we’ve been following for two seasons. Darvill, on the other hand, had to run a pretty vast gamut of emotions, modulating between incredulity, heartbreak, joy, and melancholy. For my money, he delivered the most powerful moments of the episode, the moments where he broke down in seething anger at the Doctor. 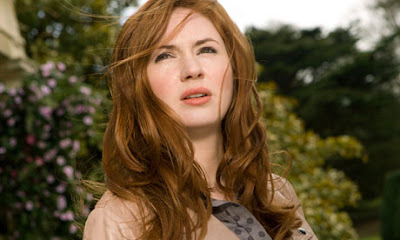 Seeing Amy hate the Doctor is arguably more shocking, but with Rory, the reaction is more resonant; he was dragged into this world against his will, following the Doctor because of his love of Amy, and for Rory, there can be no bigger betrayal than seeing his marriage torn apart because of the Doctor’s antics. In fact, the Doctor was portrayed very differently this week; in most episodes, the Doctor is always the sympathetic hero. Even when he messes up, he means well, and always has a way to set things right. We typically view the story through his eyes, and therefore champion his every decision. Here, however, the story was framed from Amy and Rory’s perspective, and when Amy proclaimed her hatred of the Doctor, we weren’t just led to understand, but to agree. From start to finish, the Doctor clearly never grasped the full depth of the situation. He felt horrible for his mistakes, but he views time differently than others, and therefore can never quite understand what it was like for Amy to wait 36 years in solitude, or the impossibility of Rory’s choice. Even at the end, when the Doctor shut old Amy out, he only saw things as an equation; they had saved the ‘real’ Amy, and now the time-stream could be set right. He didn’t understand that to Rory, both Amy’s were equally real. That’s a very dark note to give the Doctor, a subtle but powerful arc for Matt Smith to play. Smith was fantastic with the material, of course, especially at the end, when young Amy wakes up and asks “where is she?” The episode ends with a close up on his face as the Doctor finally realizes the vastness of what he’s just put Amy and Rory through, and it’s a huge punch to his time-lord gut. MacRae handled all the characters wonderfully, but I also have to highlight the wonderful premise he invented to make the story possible. The ‘two-stream’ system on Apalapucia was fascinating, one of the most creative scenarios a Who writer whose name isn’t ‘Moffat’ has come up with in the last few years. The concept of using multiple time-streams as a ‘kindness’ to the infected and their families was simply ingenious, and the set-design brought that all to life wonderfully. I have no idea whether or not this was a ‘big-budget’ episode of Who, but it certainly looked like it with all the impeccably crafted and detailed sets. Along with Nick Hurran’s expert direction, this was another very cinematic episode of Doctor Who, something this entire season has excelled at. The same can be said of Murray Gold’s musical compositions; his score is a gorgeous masterwork every week, but his beautiful, nuanced work on “Waited” was my favorite of the entire season. In the end, I loved “The Girl Who Waited” for the spotlight it put on the Doctor’s companions, two characters whose impact on the Moffat-era of Who has been immeasurable. “Waited” was another standalone, and while I’m still a bit irked that the season hasn’t been sequenced more logically – we’re taking awfully big breaks in the overall story arc at this point – that’s not a reflection on the episode itself. It was a wonderful hour of Who, one that I would be happy to watch at any point in the season’s run.